I know that you are about to be doing a home renovation so I am sure that money will become a little tighter, so I was just wondering what you will spend a lot of money on no matter what the cost?? The house that Jay and I currently live in is not the house that we plan to stay in forever, so we aren’t planning on spending a fortune on any of our renovations. Sure, a kitchen definitely isn’t cheap, but we have been looking into ways to cut costs. It’s amazing how much money we can actually save by doing some of the labor ourselves – I’m sure you’ll be seeing me with a sledgehammer sometime soon! We also have some really great friends who have offered to help us out with different areas too. So I really don’t think there’s anything I’m super “gung ho” about – if I can somehow save a few bucks, I’m going to do it! Do you put dressing on your salad? In this post it doesn’t look like it, so I was just wondering. Most of the time I do add some sort of dressing to my salads, but it also depends on the toppings. If I’m eating leftover roasted veggies, a little splash of balsamic vinegar usually does the trick for me. But with a fresh veggie salad, some of my favorites are a simple oil & vinegar, Ken’s Light Balsamic Vinaigrette, Kraft Sun-Dried Tomato Vinaigrette, Kraft Roasted Red Pepper Italian with Parmesan, & anything by Annie’s Naturals. Do you think you will stay in NY forever? Do you and Jay see yourselves moving ever?! Great question! There is a huge part of me that wants to say that I would up and move as soon as the opportunity presented itself. Not being a fan of the cold, I’ve always found some of the southern states to have much appeal; especially North Carolina. I also really like the idea of having the experience of living in another state and being out of my comfort zone. Jay and I talk about it quite often. Then again, we have so many supportive friends and family where we are, and have become a part of so many great communities, that it would probably take a lot to get us to leave. What are the best and worst things about living in your area of New York? Best: Living near so many friends and family, watching the seasons change, being able to travel to so many places (Lake George, Vermont, NYC, Massachusetts) in less than three hours! Worst: Dealing with cold, snowy, icy, nasty winters. I’m not a big fan of the cold, or snow. I would be beyond thrilled if it only snowed on December 24-25th for the rest of my life. 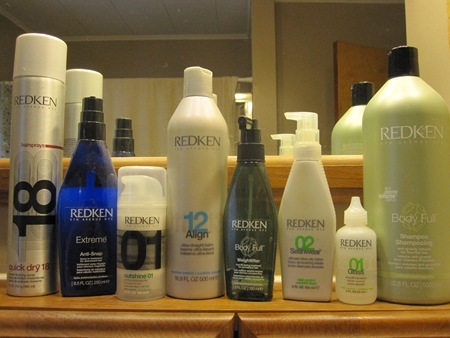 What Redken products do you use? Do you use a straightening iron? Well, here’s all the goods that I’ve acquired over the last couple years. I definitely don’t use them all at the same time, but I like to switch back and forth with a few. For example, one day I might just use the Body Full root lifer, and the next day I’ll use a combination of the Extreme + Align. Very rarely do I use the shine glosses, just because I hate getting my hands all greasy. I have a straightening iron and a 2-inch barrel curling iron that I alternate. My hair is naturally straight, so the only reason I’ll use the straightening iron is to smooth out the ends. If I feel like a little more curl & volume, I go with the curling iron. How do you do red highlights without looking silly? Yikes, this is a tough one! After talking to my mom a few times about it, I’d say there’s a few things you should consider: your natural hair color, your skin coloring, and the effect that you’re going for. For me, I wanted my color to have more of a red undertone, so my mom mixed a bright shade of red with a couple other shades of brown to neutralize it. I’ve always liked my hair colors better with a subtle effect, not the “WOW” your hair is red/blonde/etc.!”. But as always, just work with your hairdresser! And if you’re in need of one, and live in the Upstate NY area, I know a couple good ones to recommend. How do you plan on teaching your children to eat healthy when you start a family? What a great question! Children learn so much about food, behaviors, really EVERYTHING through example. I will want my children to know that eating healthy doesn’t have to be bland or boring, and I’ll show them that. I will want to be a role model for them in the kitchen. They’re certainly not going to see me sitting down to dinner with a Hungryman frozen dinner, or watching TV with a box of Twinkies in my lap. But they will see me preparing healthy, nutritious meals and snacks. There’s always got to be a little wiggle room, so I’m not going to restrict them from many foods. But it will be my goal to get them to enjoy healthy foods and making smart choices, not just eating them because they “have to.” Now, does that mean that they won’t see me indulge in the occasional bowl of ice cream or chocolate chip cookie…probably not. But that’s ok! Q: I am so excited to try out some of your cupcake recipes! Do you just experiment until you get the taste you want? A: Sometimes, yes. I’ll usually pick and choose pieces of different recipes that I like, or I’ll add in substitutions that I know would be a good fit. If it’s something I’ve never tried before, I’ll be more likely to stick to the original recipe the first time…then “Courtney-fy” it. Q: What are ten things that you really want to do before you die? Travel to Europe with my husband, especially Italy & Paris, France, and explore all the fabulous cuisines they have to offer. Hello, dinner in Tuscany? YES PLEASE! Have children – two or three – and would love a boy/girl combo…but obviously I’ll take whatever I’m lucky enough to have.